This game is perfect for all age groups. Best of all, it is simple to make! Cut the wooden sticks in two. Insert two sticks in the ground (forming a parallel line), making sure a large portion of each stick is visible above ground. Gently slide one end of a swimming pool noodle over each stick to create an arch. Note: When you purchase your swimming pool noodles, make sure they can easily be bent. I tested two types of noodles. My blue noodle was somewhat less flexible. The yellow noodle was more flexible and therefore much easier to position over the dowels. 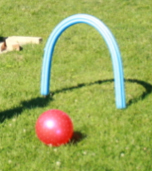 Simply deposit a few balls next to your arch. Encourage children to explore this new game. Like in an actual soccer game, children can push the balls with their feet to make them go through the little "bridge". 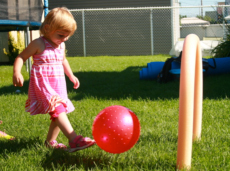 This activity will be very attractive for older children who will also enjoy running around the yard with the balls. This game is great for younger children. Invite babies and toddlers to sit in front of the noodle arch. Encourage them to roll the balls under the "bridge". This game is perfect for working on cooperation and developing a bond between children of the same age, an older child and a younger child, or even a child and his/her early childhood educator. A special thanks to Isabelle who gave me the opportunity to test this game with her group.